It is very important to get a building permit before commencing the construction of a commercial building or a house in the Philippines. A building permit is a legal document issued by the Office of the Building Official in your city or municipality that authorizes the construction of a building. So what is the purpose of a building permit and why go through the hassle in getting it instead of just starting with the construction? It is required by the law in order to ensure safety and see to it that the architectural plans (including structural, electrical, sanitary and mechanical plans, etc.) are compliant with the National Building Code of the Philippines. Well, constructing a commercial building or even a house without a building permit, the local government has the authority to stop the construction. Then you will be obliged to get a building permit to resume the operation. It is essential to get this beforehand since in worst case scenario, if the architectural plans of the building does not conform with the National Building Code, there is a possibility that reconstructions are to be done. These are the general requirements to get your building permit. Don’t worry yet if you are not too familiar with them since you can have more information on the Office of the Building Official in your city or municipality. Go to the Office of the Building Official in the municipality of city where the building to be constructed is under its jurisdiction. With a proper diplomacy, approach a person-in-charge that you are going to apply for a building permit. You should be given a checklist of requirements that you need to submit and the forms to fill-up. Your hired engineers are the one’s who are going to fill those forms. When your requirements/documents and forms are ready, you can go back to the Office of the Building Official to submit them. You shall be instructed where to pass your requirements to be assessed. After the submission, you shall be given an Acknowledgement Slip. Written on it is the estimated date (usually after 10 working days) wherein your documents should have already checked and assessed. On the given date, go to the office again. This time if your documents are accepted and approved, you shall be given an Order of Payment. Proceed to the Treasure’s Office to pay for the necessary fee/s. Get your official receipt and present it to the releasing section of the Office of the Building Official. Most of the time, they’ll give you few more waiting days (usually 5 working days) before your Building Permit ready to be claimed. 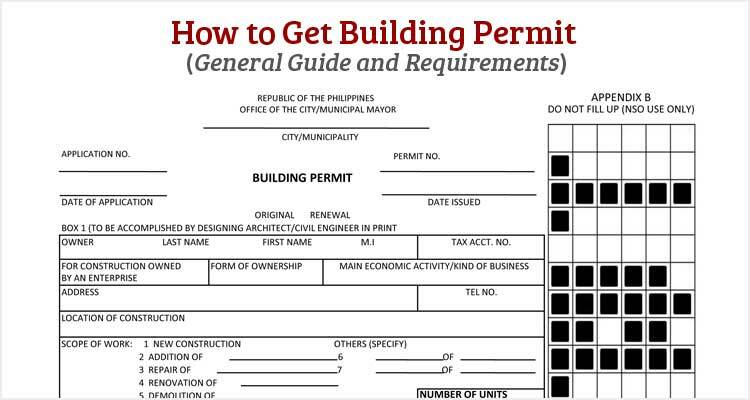 That was the general guide on how to get a building permit in the Philippines including the requirements. If you have any questions or additional useful information regarding this, do share it in the comment section. Hi, I’m from Caloocan City. I would just like to ask if papataasan lang naman namin yung bahay namin kasi bahain. Kailangan pa ba ng electrical structural etc. plans? Lumapit kame sa city hall and they are asking of 70,000 Pesos e hindi naman po isang bagsakan ang pagpapagawa namin ng bahay pag nagkapera lang. Yung if hanggang saan abutin. 200K pa lang pera namin yung hinihingi nila wala ng matitira sa pagpapataas namin ng bahay. If may contact number po kayo pwede tawagan kasi nakakastress po talaga sya. I am building a double storey house at marinduque Mogpog, the municipal saying after the construction completed and fully furnished, they required Fire Team to visit the site. Is there such a requirement and also what is the purpose of having the unit fully furnished only the department of Fire come for visit? Yes need mo specially structural plans. One storey is designed for one-storey. Two storey is designed for 1&2 storey, kung ang existing house nyo which is a one storey, you can’t extend to a two storey, but if and only if yung existing nyo ay may probation for a two storey and applied it before as a two storey, no permit needed. Mayroon po akong inuupahan na bahay kaya lang yung may ari wala daw pera pangpagawa kaya nagkasundo kami na sagutin ko na ang pagpapagawa iaawas na lng sa buwanang upa ang mga magagastos ko. Pinapapalitan ko lang naman ang mga bubong at pinapinturahan ang loob kasi gagawin ko syang kainan. Dapat pa ba ako mag apply ng building permit? Mayroon kasi nagpunta na taga munisipyo daw sya ang sabi naman ng mga gumagawa wala naman nabago kaya di na nag apply ng building permit. Yun lang po. Umaasa sa inyong tugon. Lahat ba ng mag start ng business kahit yong maliit na sari-sari store kukuha ng building permit at occupancy permit na existing naman yong bahay? At kung na rent lang po walang binago sa building space nagtitinda ng ukay-ukay kukuha pa ng building permit as per requirement ng zoning?